This could have been a depressing comic, but instead I decided it should be bacon. P…pocket bacon. POCKET BACON. Derk I love you so much but you stoop pretty low sometimes. Again, sorry for the lateness. As of today I am working an eight-to-five internship at a law firm – I am very fortunate and happy to have it, but bear with us as I balance drawing with working all day and the other new duties that come with living on our own as opposed to the coddled life of the college dorm. There will still be three comics this week! We couldn’t keep you hanging at such a climactic point in the story. I just want to thank our readers and especially the commenting family for being a reliable bit of awesome in this new and busy time in our lives. I love you all, I mean it! Btw the gift of bacon is almost more important then the gift of the bottle. 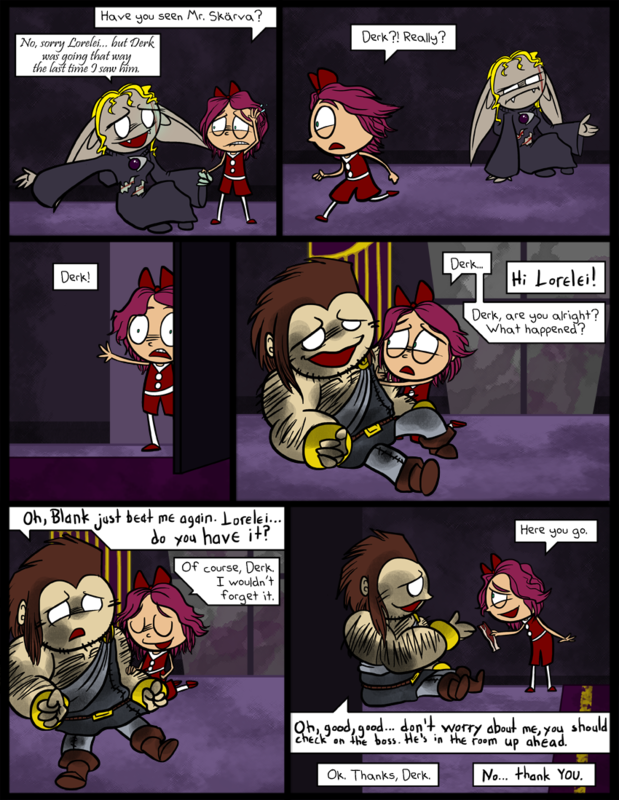 Next page, I wonder if Lorelei’s gonna run into Blank as he’s leaving the castle. Hmeati branches? Is that where bacon grows? And, aww… you’re welcome! It brings me happiness, especially to know that it brings other people happiness… I won’t ever abandon it no matter what else life thrusts upon me! the bacon isnt presented in a glass bottle? 1740 tedlech sounds like a vintage wine. REALLY vintage. Jeez. bacons heal derkleton all the time. AND…..WHERES HIS GOLDEN BACON? or is that only for special occasions? Why would you even want golden bacon when it is already so perfect? Is she not healing anymore because she’s rushing? I mean, I’d think she’d be putting Skärva on top priority unless if something else is going down. Captcha: ‘and iaringi’. We cannot forget about iaringi and his valiant efforts. Yes and no – she does want to get to him, but she can’t just run past all these minions that are hurt. Not until she heard definite word of Derk, anyway. She loves Derk more than anything else in the whole wide world except for Mr. Skärva. 1) Given his entirely white eyes and apparently light-based powers, Derk is a spirit of light, perhaps sent to nudge Skärva towards Good – or perhaps even a subtle ploy by the gods to nudge Skärva back into their graces. 2) Derk is actively healed by bacon. On the art side, I do think that Derk’s pose in the second-to-last panel is a little ambiguous, leaving him feeling a little as if he’s floating. In particular, I think that the main issue is that the hem of his tunic angles downward (as seen in the image), when I think that I’d expect it to angle upwards as it passes over his legs. Nice try, but what makes you think the gods WANT Skärva in their graces? He’s quite useful to them as he is, don’t you think? And I’m surprised, there is something true about Derk that no one has come up with yet, but I keep expecting people to realize! …I’m not sure I’d be able to reveal it if anyone did, though. There’s a name for the thing that he wears? O____O …YES, that’s exactly what it is. A “nkenia” is an awesome person who doesn’t comment nearly enough. hmm. (lucky guess) but does derk represent abscond? I have an idea as to what Derk is but don’t want to sound stupid. So I’ll just keep it to myself for a bit, until someone prods it out of me. Love the comic, love the bacon. I had bacon in my toaster struedel this morning (it’s one of those egg, bacon and cheese ones, yummy). Bacon is amazing. There’s a candy store near me that sells bacon lollipops, bacon bandaids, and bacon car air fresheners. If I had a car, I’d totally buy one and make my car smell like bacon. ‘oprichT sought… Opricht sought out the magical golden bacon that grants it’s eater the powers like that of a gods. Only like… half, though, because they [the gods] wouldn’t want a human to have ALL their powers. I’m being awfully chatty tonight, aren’t I? Derk is somehow related to the gods (or is possibly one himself or an incarnation of one). there is a candy store in my hometown that sells bacon chocolate bars. I’m too scared to try them, though, cuz I don’t want to waste nine dollars on something I’ll only take a few bites of. Also I think I may just stop confirming or denying any of you guys’ theories. They’re too fun and I don’t want to burst anyone’s bubble or narrow down the possibilities. Derk’s pecs ARE pretty godly. i had bacon in a cinnamon roll before. it may sound odd but it was DELICIOUS! That… sounds disgusting. But I would try it anyway. alter. when you go to a college party, bring some 1740 tedlech. I have a little pin that says “bacon makes everything better.” I’m not sure if it’s claiming that the addition of bacon to any other food will improve it, or if it’s saying that bacon can cure all your pains and woes, but for Derk the latter is definitely true. Poor thing. Well, that’s what she signed up for after all. Any of them should feel grateful to get a Lorelei at all. Skarva especially so. lorelie is so sweet <3, she know what derk wants. to bad see left the other girl just hangin. but there is BBBBBBAAAAAACCCCCCCOOOOONNNN. it looks raw. does he eat it raw??? eietic Market so like they sell lightning bolts. Nah, it’s cooked. It’s probably pretty cold by now though. And covered in lint. I guess I will come out of the shadows of just reading your comic and say something. Something true about Derk, huh? Something I’ve noticed is that Lurkins are the only race in which everyone lacks pupils, and they can do magic. Derk is the only human without pupils… and he can do magic. Coincidence? Also, Derk and Blank must be relatives somehow. And now a question about your style. Is there a particular reason you draw three lines on practically everyone’s noses even though they aren’t necessarily making a face that would wrinkle their noses? Not that it’s a bad thing, but I think it makes Lorelei look… unusual. Yeah… I really like your comic. Does it SEEM like a coincidence? I ought to say he’s not the ONLY human without pupils though. They’re just really rare… but it’s a heritable trait, a recessive one. And it comes from…. well ANYWAY thanks for coming out of the shadows! Oh man, that. Well it started off as a wrinkly-face thing and also to accentuate when people are kind of dark around the eyes, like when they’re tired or… just generally shady-looking I guess. But I started going overboard with it and it just became how I draw humans. (Did you know before this comic I avoided drawing humans as much as possible? They’re hard!) But I should tone it down. Thanks for pointing that out. Well I didn’t want to spoil all the fun but ok if you insist, THEY ARE NOT RELATED. Derk does have quite a bit of hero in him though, and the way they bantered was almost brotherly. I can see where you’re coming from. You better not pull that whole “brother-in-law” thing. Bacon can heal even the most fatal of wounds. Except maybe getting cut in half, but you know, I think Blank’s too nice of a guy to do something like that. “records hensel” says Captcha. Who is Hensel? Not even Lorelei could heal that, either ^_^; And yeah, Blank never kills. o gosh. so SO many captcha references. also i love the expression of the lurkin. shes all “wait, were’t you going to heal me?” haha i loved it. and i feel bad for her. Thanks! It’s going really well so far. Everyone there is so friendly. I can’t help but notice that the Lurkin has scars on his face…scars that are near-identical to the ones Blank has been sporting recently. Blank, you’re a sick man. He probably didn’t do it on purpose. Probably. Lurkin’s face in second pannle = WOOMP. operational freepo… ok. freepo. sound’s like somebody farted. but don’t worry. it’s fully operational. If this ever became a cartoon or something the guy who voiced zim in Invader Zim would be perfect for skarva! Hm… I think the fact that it is bacon is distracting from the fact it is bacon. As opposed to healing-magic. Our little Courtney is growing up :’). PS I got a bookmark that looks like bacon at a book fair today. No books though. PPS Captha is easesi school. No, captcha, school is NOT easy.